Brett Madron explores what “Family Day” looks like at Tahanan and why such an event is an important aspect of youth ministry in the Philippines. Learn how our biblical certification program is impacting our student interns at Tahanan as reported by program administrator, Tim Sherrod. Team Member, Brett Madron, writes on the expression of music in one’s native tongue in reflection on his relationship with SEA Intern, MC. Nate Cameron interviews GOD SEA employee, Irish Dagami, about her experience teaching children in light of God’s Word she is learning. Team member, Leafa Vagatai, reflects on her visit to Magaan and the plight of this community of island fishermen. Rina Miller provides an insightful perspective on the plight of a postpartum mother in rural Philippines, and how her work with a midwife is saving lives. Institute student Carl Cook testifies to the way that his biblical education prepared him for his Immersion trip to the Philippines. How does a self-proclaimed young, white, privileged American girl stand in front a crowd of incarcerated, impoverished Filipinas, and preach to them God cares for them? Darbie Guess was disheartened by this question, but committed to finding an answer. Anytime we have the privilege of traveling to our ministry hub in Tacloban, spending time studying the Word together is a priority. Amidst all the ministerial work we do, we prioritize training up people who are skilled in God’s Word. That was no different last month when Chris Cameron and I led a team of students from the Institute for G.O.D. International to Tacloban. 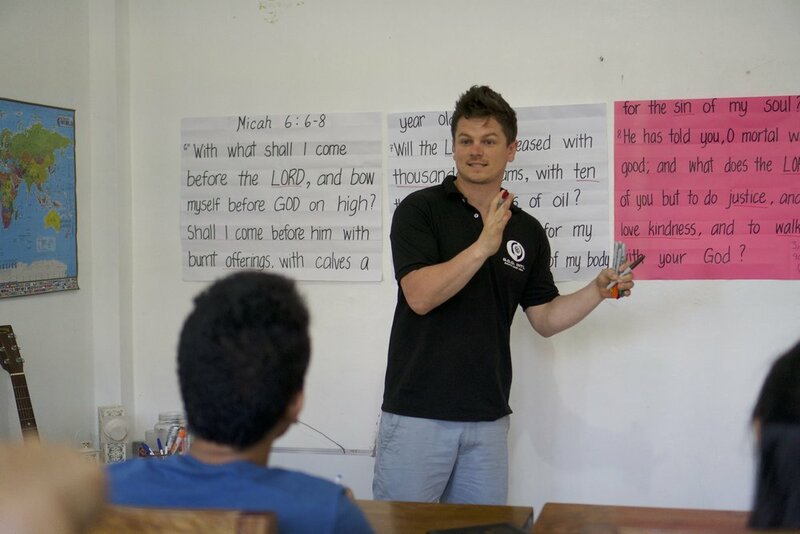 Trip objectives included a ministry orientation for new interns and providing a music workshop for local youth. However, our primary energies went towards hosting an educational seminar on Biblical Interpretation. This seminar was geared towards Filipinos who were hungry to go deeper in their study of the Word and were willing to put in the work to attain helpful tools to do so. The writer of Deuteronomy 8:1 instructs, “This entire commandment that I command you today you must diligently observe, so that you may live and increase…” The Scripture communicates a direct connection between our careful and rigorous approach to reading the Word of God, and the fullness of life we experience as a result. Jason teaches Micah 6:6-8, a key passage used by he and Chris to apply biblical interpretation skills. There were 10 attendees to the seminar held at Tahanan, all of whom are regular participants at the community center. After a time of worship and exhortation to focus our hearts on the Lord, we introduced interpretive tools that help unpack the rich but complex texts that make up the Bible. These tools help readers discipline themselves to observing the genre, historical context, repeated words, etc… before arriving at an interpretation on it’s meaning. In our plenary session we walked through an Old Testament passage (Micah 6:6-8) and practiced analyzing the terms and poetic format of the communication, before moving into a discussion of what message means for us today. After receiving instruction in a class setting, participants worked in groups to dissect a passage of scripture using the literary tools taught at the seminar. I believe that as our South East Asia team continues to prioritize education in the word of God, we will continue to see the fruit of that investment in the lives of the young people at Tahanan committed to knowing his word and participating in his kingdom. Hear more from the 2018 Biblical Interpretation Seminar participants on our VIDEO BLOG! Regional Team Member, Chris Cameron, reports on the inaugural year for the SEA Internship at Tahanan and the expectations for each of the three participants. Institute student and Immersion participant, Amanda Byrd, reflects on an impactful visit to a rural home in the Philippines, assessing the health of a widow. "No matter how busy a woman’s life can be...our time with the Lord will be our source of energy." Read Rina Miller's reflection on her mother’s Bible study. Clark Miller reports on the new Program for Assisted Studies at Tahanan Community Center. It is a mutually beneficial program that helps students who don't always have the finances available to have access all the resources they need for school. Josie Putnam reflects on her internship and immersion to the Philippines and the lessons she's learned along the way. Nathan Cameron looks into our Institute students' December immersion in the Philippines: what'd they do, what'd they learn, why it's important for their journey. Brett Madron reviews a recent teacher seminar we conducted in the Philippines at a high school nearby our Tahanan Community Center.